Advantage 2000 (GL2072-A3) Plus workstations from Great Lakes are designed for today’s technical workspace environments. The unique design of the advantage A3 computer desk permits maximum flexibility in equipment configurations. The units are ruggedly constructed with heavy-duty steel to ensure strength and longevity. The storage drawers and overhead compartments are lockable, delivering critical security requirements. Many accessories can be added to the units including peninsulas, cable management solutions, and LCD flat-panel display mounts. 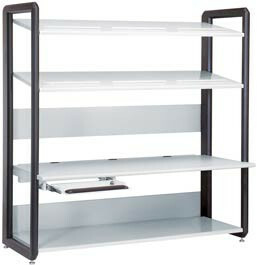 The Advantage product line contains numerous models and configurations to fit any office environment.